Deforestation of peat forest in Miri Division. This will be an oil palm plantation in a year’s time. You might be thinking this is an odd statement from someone who runs an entire website promoting the use of natural and organic body care products. I was reading an article the other day that talked about how a natural and/or organic products aren’t necessarily a better choice for the environment. Over harvesting of plants and flowers. Some plants need to be harvested in massive quanities to produce a small amount of an ingredient. Rare/exotic plants being exploited and harvested at an unsustainable rate. 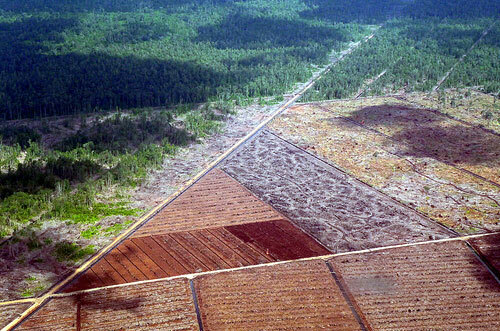 Eco system destruction – a good example of this is areas of rainforest being cut down to create palm oil plantations. The amount of water needed to grow certain plants. So how can we make sure that we aren’t making a worse choice by choosing a natural and/or organic product? Looking at how a company and it’s products measure up in 5 key areas: ingredients, manufacturing, packaging, product disposal and location. Does the company operate any kind of controlled gathering procedure? For example Weleda’s policy for the gathering of Arnica flowers is: only open flowers are harvested, short stems without buds and there must always be at least one flower left on the bush. Are the ingredients grown without the use of chemicals and pesticides? Is it a water intensive crop like soybeans? Do any of the ingredients require an energy intensive process for manufacture? Does the manufacturing plant use renewable energy? Does the company offset carbon created during the manufacturing process? Are the products manufactured in small batches? – fewer machines, more people, requiring less energy overall. Can the packaging be reused once the product has been finished? Is the packaging recyclable? Or is it easy to separate the recyclable parts from the non-recyclable ones? Is the packaging made from recyclable materials? Is the packaging excessive? A couple of companies who use very simple packaging are Aubrey Organics and Pure Nuff Stuff. Both of these companies use plain white recyclable bottles with very little coloured ink. Does the product biodegrade or contain any biodegradable materials? Does the company offer a refill service? Do any of the materials release toxins into the environment? Where are the ingredients of your product grown? – I don’t think it’s a case of refusing to use shea butter, coconut oil or lemons because they come from another part of the world (think of the jobs it creates), but I think it is important to make sure it is grown and shipped in a way that isn’t going to negatively impact on the environment or the people that grow it. How does the product reach you? For example, does it have to be flown to you or is it manufactured in your country? By thinking about these questions when you make your purchases, it will help you find the true greens! Image source: Sarawak on Flickr.